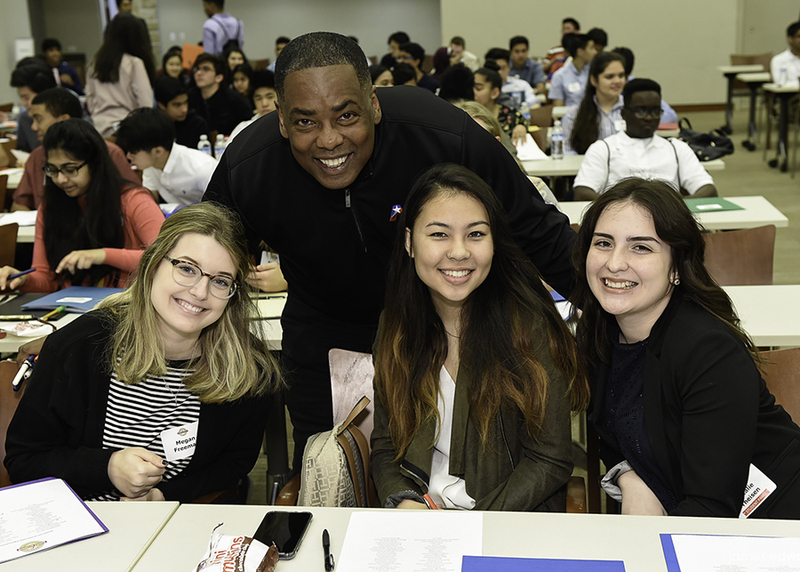 Mock interviews, elevator speeches and speed connection sessions made for a busy Saturday as approximately 425 Plano teens gathered at the Capital One Conference Center for a rigorous “training camp” as part of the Plano Mayor’s Summer Internship Program. With edibles aplenty, the dedicated students soaked up six hours of seminars, resume building, drills and life skills in preparation for the April 26 Job Fair. It’s all in hopes of securing a sought-after, eight-week paid internship at one of Plano’s most prestigious businesses, nonprofits or government agencies. At the helm, Capital One – the program’s founding and presenting sponsor for six years – orchestrated the entertaining, yet instructional, curriculum alongside Plano Mayor Harry LaRosiliere and eight intern alums, who shared sage advice and fun anecdotes from their summer internships. After welcoming remarks from Capital One’s Paul Littlejohn, Mayor LaRosiliere delivered his annual pep talk, noting that “you should be the person today who you plan to be in the future.” He shared his formula for success as an algorithm that finds a balance between health, happiness, honesty, love, hard work, learning, desire, and a commitment and willingness to sacrifice. He also noted the four “L’s” of leadership – listen, learn, lead by example, and let go and trust others. Then the intern alums took over. In a light and conversational manner, Hunter Helms and Burak Torlak peppered their fellow alums – who worked at Frito-Lay Headquarters, Habitat for Humanity of Colin County, Ericsson and more – with questions about their internships as hopeful students listened, laughed and learned helpful tips. Once the intern panel wrapped, Capital One executives led a discussion on presenting your personal brand and how to develop a polished 30-second elevator speech. New this year, the students broke into groups as they participated in “speed connection” sessions. Similar to speed dating, the teens were tasked with networking and connecting with the person across from them in a fast-paced format. After lunch was generously provided by Kroger, a North Texas Food Bank rep shared insights on behavioral interviewing followed by mock interview sessions guided by executives from Capital One, Dallas HR and the Junior League of Collin County. The crash course provided the teens with a plethora of practice for the Job Fair, which takes place Friday, April 26, from 2:30-6 p.m. at the Plano Event Center. The Plano Mayor’s Summer Internship Program runs June 10-Aug. 2, and students will earn a minimum of $10 per hour working 20-to-40 hours per week. Mayor LaRosiliere is still seeking businesses to participate in the program. For more information, go to planomayorsinterns.org or contact Vicki Wait at vicki@vwaitgroup.com.